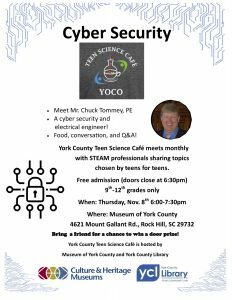 Mr. Chuck Tommey, PE came in to talk to York County Teen Science Café in Rock Hill, SC about cyber security. Mr. Tommey began his presentation with the common misconception of the definition and connotation of the word “hacking.” He explained that hacking can be both good and bad, depending on who the hacker is and his/her intentions. He continued with incidents of hacking, which occurred internationally, including Russia’s interference in the 2017 election, the electricity hack of Kiev, and other hacks involving China and North Korea. He discussed the dos and don’ts of the electronic world. This particular subject sparked the interest of the audience because today’s teens are the generation of technology. It showed how one small hole can sink a whole ship. He addressed how public Wi-Fi facilities are a hotspot for black hat hackers (bad hackers). Virtual Private Networks (VPN) is a technology that white hat hackers (good hackers) suggest everyone use because it ensures safety and encryption of private information. He had an interactive activity, which included everyone downloading the Tunnel Bear App, a free and effective app. Cyber Security is a very beneficial field. There were a number of fascinating discussions in the seminar such as social media awareness, password management, guidance, and much more. The presentation left the audience with new knowledge, satisfaction and confidence concerning the safety of their technology and private information. Overall, this was an extremely informative and engaging presentation by Mr. Chuck Tommey.